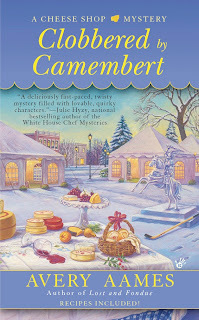 CLOBBERED BY CAMEMBERT came out yesterday and I had a terrific launch party at Mysterious Galaxy with my pal Kate Carlisle (Bibliophile Mysteries). We had cheese, wine, good chats, fun! 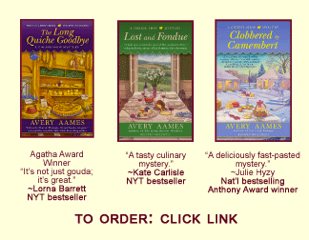 Adams (aka Lucy Arlington) has a new series out, as well. 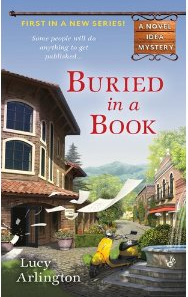 A Novel Idea Mystery. Don't you love the title? Go Lucy (Ellery)!!! I'm in full-PR mode right now. I'm having a contest on my website (see below) and I'm heading to Houston this weekend to sign books at Murder by the Book. In addition, I'm doing a few guest blogs. If you need to eat gluten-free like I do, check out this post on the Gluten-free Guidebook. 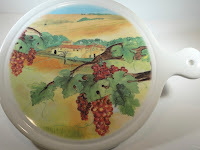 And another on BLOGHER. Of course, while traveling, I need a little sustenance. In CLOBBERED BY CAMEMBERT, I have a fun recipe that I intend to share with my family in the Bay Area for Sunday brunch. 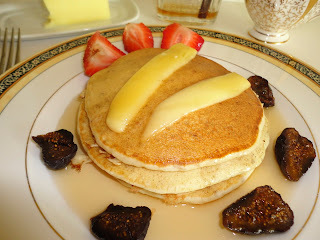 Pancakes with Melted Gouda and Dried Figs. This is a breakfast that Charlotte serves to the twins. [For Clair, she makes gluten-free pancakes * recipe below] When I'm writing, I try to come up with new meals in every chapter or every other chapter. Sandwiches, dinners, breakfasts, snacks, desserts. I came up with this recipe because I was thinking about a favorite of my mother's: Monte Cristo Sandwich. That's French toast filled with ham and cheese, cooked up crispy and served with syrup. I hope you enjoy. The pancake recipe is my grandmother's recipe, tweaked to be gluten-free. Make your favorite pancake mix according to directions. Warm the maple syrup by heating a pot filled with water. Set the syrup carafe into the boiling water. Turn off the heat. Heat griddle to 400 degrees. Put 12-16 dollops of pancake mix on the griddle. Cook to desired color of golden brown. Flip. Top each with a piece of Gouda cheese. Cook until the underside of the pancake is desired color of golden brown. Set the pancakes on two plates. Surround with sliced figs. Drizzle with warm maple syrup. Combine the milk, oil, eggs, and vanilla. Add the sugar and salt. Whisk. Pour the dry ingredients on top, stir, and then mix with a blender to remove all the lumps. Using a 1/4 c. measuring cup (or a soup ladle), dip the batter out of the bowl and pour onto your skillet. I can fit four to six pancakes on my square skillet. Let the pancakes cook and do not touch them until you see bubbles popping in the middle of the pancake. Flip the pancakes. Cook for a minute on the second side. Remove them from the griddle and slip them into a plate that is warming in a 200 degree oven. Make another batch until you’re ready to serve. for the month of February, ends March 1. You can win an adorable Cheese Paddle from Sur la Table! 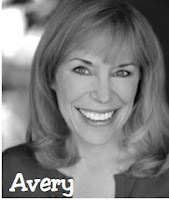 But Avery, I need a good Paddling... Is your contest only for new subscribers to your newsletter??? Ah well, as always, best of luck with the launch. I did my part and plan to spend the weekend with the folks of Fromagerie Bessette. You always make Ohio sound so exotic. Dave, you're such a rascal! Avery, what an exciting launch! 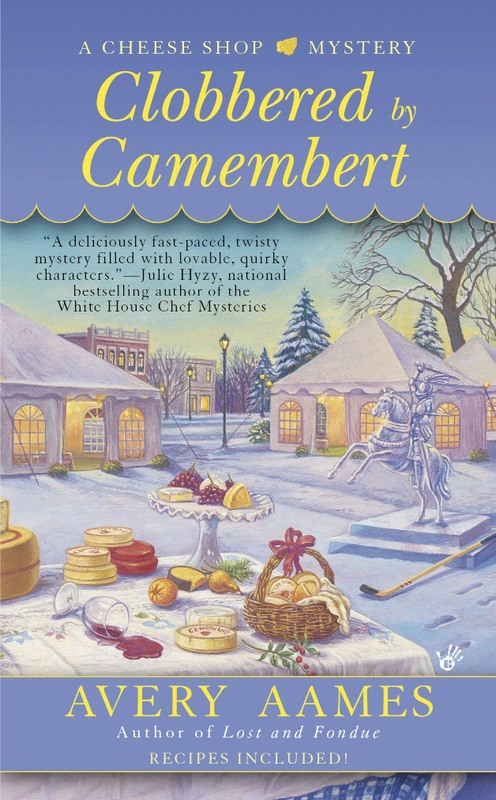 Since I got a sneak preview, I know everyone will love Clobbered by Camembert! Krista, isn't he though? LOL. Thanks for the pat on the back. Gourmet pancakes! Wonderful! Cheese and figs are a favorite of mine, and I love your idea of serving them at breakfast (or brunch), too. Your release week events sound like a lot of fun - and a lot of work, too -- be sure to take time to enjoy the fruition of your efforts. 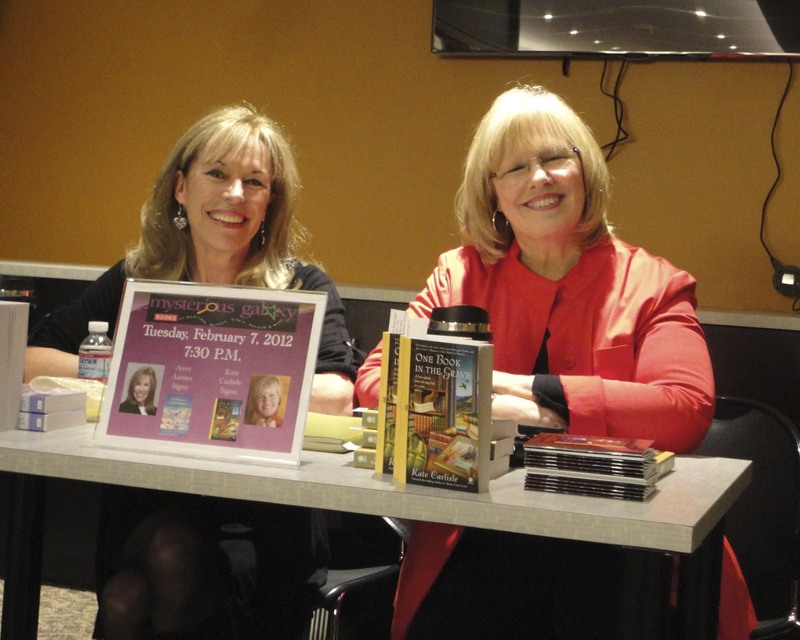 You are such a tireless supporter of so many writers -- now it's time for you to shine. You deserve it. Cleo, thanks so much for your support. I am having fun. And enjoying. 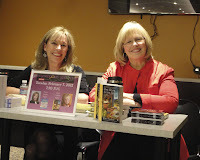 BTW, did you see the picture on Facebook of books at Mysterious Galaxy where I signed last night? They have a good assortment of cozies, including Krista, Ellery, and you. I have to admit that I didn't go through every title as I was setting up wine and cheese before the event. :) But nice store.